Start your review of Keegan McAvoy. Send a message to Keegan McAvoy. Thank You! 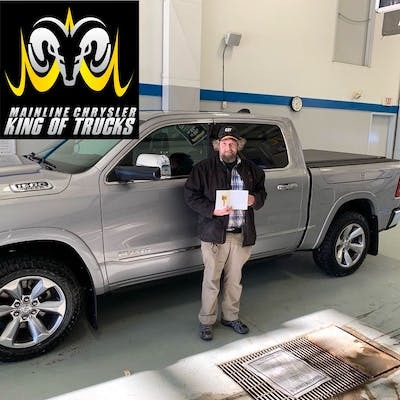 Your message has been sent to Keegan McAvoy at Mainline Chrysler Dodge Jeep Ram Ltd.
"Tasha was really helpful and friendly to deal with"
I have been shopping for a new truck for around 6 months. I have heard good things about Mainline. Rebecca was very prompt in answering my emails and starting the process prior to driving out. I was happy with the price and my Mainline experience overall. I will send friends to Mainline. Thanks Rebecca! Hi Saskamike! Thanks for the feedback! We are glad we found what you were looking for! Worth the drive is an understatement. Rebecca was awesome to deal with. She stayed an extra 2 hours after they closed to ensure I got my vehicle. Highly reccomend her and mainline! Hi Brock13, Thanks for taking the drive out to see us! Since our first conversation Rebecca has been wonderful, ensuring everything went smoothly. found the car in the price i wanted, had everything lined up so when i got to the dealership we could go right out and look at the car and test drive without having to wait around for someone to be free. The service team was able to handle the quick work i wanted done the day i was picking up the car so we didn't need to do a return trip. would definitely buy again go there first when buying our next car. Thanks hp98173! We are happy that everything worked out great! Can't wait to see you guys again!
" Shocked at our experience at Mainline Chrysler "
We drove out from Saskatoon to look at the Jeep Grand Cherokee on Jan 6/16. Mike helped us and we were pretty much decided we would get one. Mike came up with a price which sounded good and was to include a CNH Employee Discount. We were asked to call them by 6:00pm that day. On our way back home, we decided to stop in at Auto Clearing to check their prices and within 5 min were offered a price $7500 cheaper (they were completely unaware of our pending deal with Rosetown), so by 5:45pm we called our salesman, Mike. He promised to check with his sales manager & call back the next morning. He called us next day with a matching price & we told him we were happy with that (even though the trade in price had now dropped from $6500 the previous day to $3500(apparently the guy that wanted it Wed didn't want it Thurs morning)! We were driving when the call came so we parked and called Mike back with our deposit and arranged to come to Rosetown after 3;00pm at which time the vehicle would be ready! A short time later the general manager called us to say another couple was in and wanted to test drive the same vehicle so my husband told him we had already made the deposit and were coming that afternoon to pick it up - we were baffled by the call!! Keegan said he'd call us back shortly but after 2 hrs. and us needing to make the 1 1/2 hr drive, we decided to call him. That was when he told us he had sold it to the other couple ...... UNBELIEVABLE!!! We were in a restaurant at the time and my daughter & I clearly heard the conversation - he spoke in a rude and demeaning tone and his reason was that those customers had been there and we weren't. I called Mike immediately to see if this was for real, and he was sick about it & frantically trying to find us another vehicle! Our Son (who purchased 2 new trucks from them in 2015) called Keegan for an explanation and was told we had been asked for a deposit the day before so they would hold it for 24 hrs. and we had declined! That was a lie - it wasn't even offered to us! Needless to say, the employees at CNH are being made aware of this and our son already moved to Auto clearing for service! It was a very disappointing experience but we are now the Happy Owners of a Jeep Grand Cherokee, thanks to the awesome staff at Auto Clearing, Saskatoon! We will drive out to Rosetown with a thank-you gift for Mike Kidd for his effort!! He did his best! We apologize if you were unhappy with your experience here at Mainline Chrysler, although our recollection of the situation is different, I can assure you all that matters is how you're feeling and your satisfaction. We will do our best to earn an opportunity to do business with you again in the future. People come from all over the province and beyond because we really pride ourselves in always having the best price, with our first price. With many people enquiring about vehicles everyday, it is extremely tough for us to hold a vehicle without a deposit. It is also tough for us to take a deposit if someone is in the dealership test driving that particular vehicle. We hope you enjoy your Jeep Grand Cherokee! They are a great vehicle. Please let us know if we can be of assistance to you in the future, or we can help you save some money on your next purchase. We were very impressed with our salesman. He took time to look after us when he was extremely busy. There was no pressure to buy and after our purchase he was willing to answer any questions that we had. The vehicle when we went to pick it up was clean and ready to go when they said it would be.